Have you seen the Internet icon? The only thing Subservient Chicken got on his 5th birthday in 2009 was a blog post about how the agencies involved in his creation bickered over who really deserved credit. For his 10th birthday, though, the chicken flies again. Except, actually, he's been grounded. The initial idea behind the new campaign—which promotes the Chicken Big King sandwich—is that the chicken has gone missing. BK placed half-page ads in a handful of Sunday newspapers asking if people had seen him. The photo above was posted to Twitter. The subservientchicken.com website is live again, too, but brings up a 2004-style error message, which you can see below, and also includes some crudely Photoshopped surveillance images showing the chicken's most recent whereabouts. A short movie about the fleeting fame of Internet celebrities is expected to hit the site on Wednesday morning, followed by more creative executions. It's not too surprising that BK is going back to the well on this one—many fast-food joints tend to revisit their big successes at some point or other. 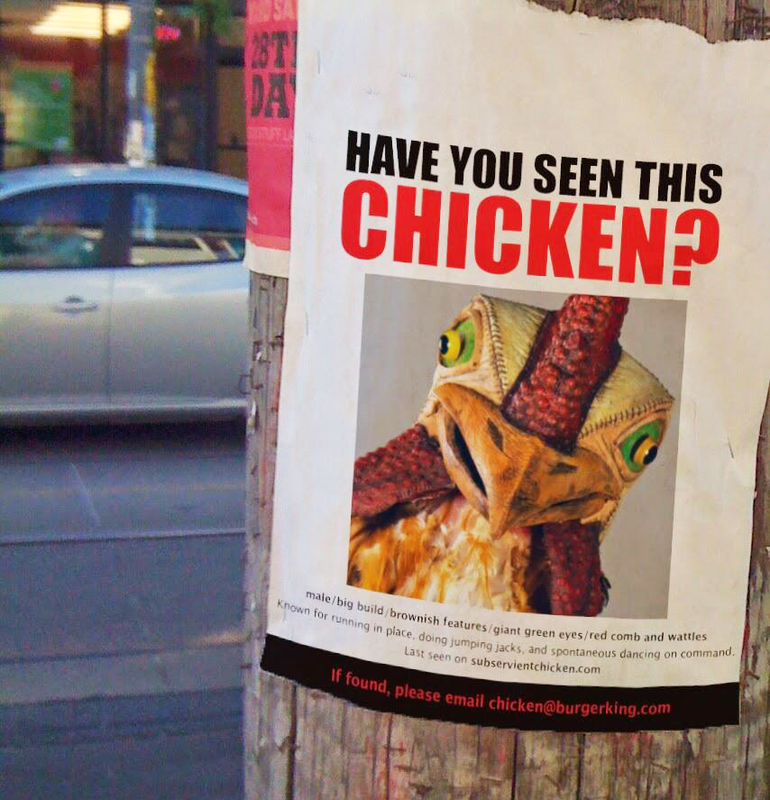 And Subservient Chicken was the go-to example of innovate digital advertising for years. Also, it's been so long since his heyday that lots of younger people simply have never heard of the chicken. As one fan wrote on Twitter of the missing-person teaser: "You guys buy Chick-fil-a?"